Snapchat has slowly but surely been building out Lenses, its augmented reality face filter platform, both as a way to keep users hooked on taking selfies and as a way to earn money from advertisers. Starting this week, Snapchat will introduce its new Shoppable AR feature, which will let advertisers display and sell products through the app’s Lenses, according to TechCrunch. The new feature builds on one Snapchat first introduced nearly three years ago when it first let companies create branded filters on its Lens platform and shortly thereafter opened its Lens Store to sell the AR face masks for $0.99 a pop. Now, advertisers can add a button to a Lens that takes users to a website where they can buy an associated product. The feature is starting with a few low-key partnerships. Those include one with hair care provider Clairol, which is selling a “beauty product trial” through Snapchat, and one with Adidas, which is selling its pair of Deerupt running shoes, according to TechCrunch. There are also a couple branded exercises that aren’t directly selling products, but they will help hawk games and movies you’d consume outside Snapchat. 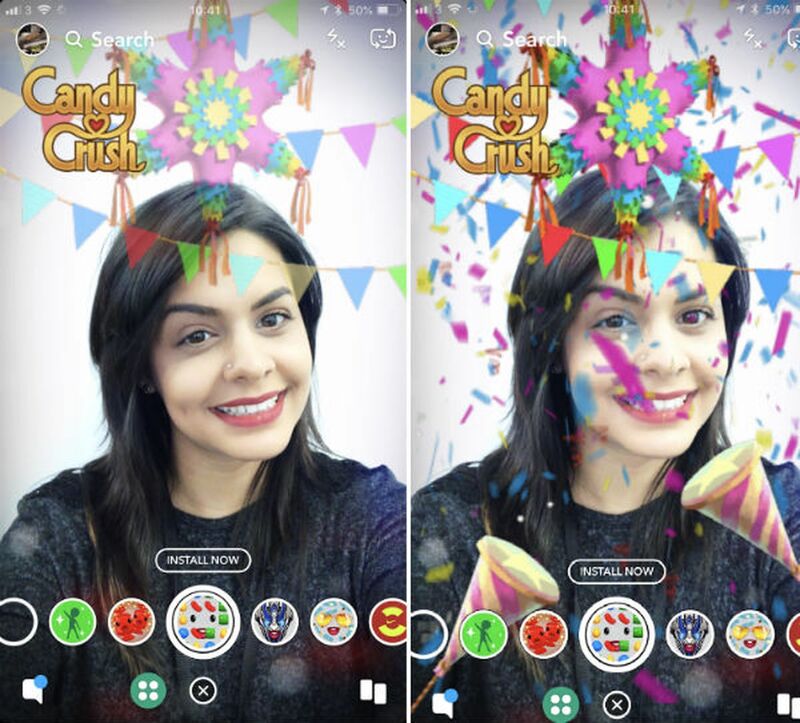 For instance, mobile appdeveloper King has a special Candy Crush Saga filter that doubles as an AR game you can play from within the app, and media production company STX Entertainment is using Snapchat to promote Amy Schumer’s new movie I Feel Pretty with a link to the trailer. This new brand-friendly Lens feature builds on Snapchat’s introduction of Lens Studio just yesterday, which will let creators design and release the app’s signature AR filters for the first time using a set of included tools, objects, and effects. According to Snapchat parent company Snap Inc, Lenses are used by more than 70 million users per day, and they’re arguably the company’s most unique and potentially profitable advantage it has over Facebook-owned Instagram, which is a popular destination for ephemeral Stories but not necessarily the AR face filters Snapchat largely popularized years ago.